If you follow us regularly, you know we have a Pop Culture Bucket List that we have set out to complete. This includes visiting various sites where famous movies and shows were filmed, experiencing entertainment-related adventures and mostly talking to our pop culture icons. 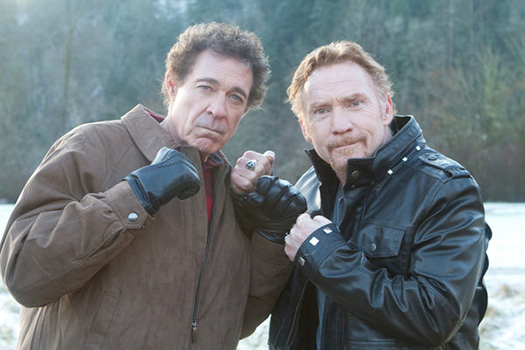 Last week we checked two off of the list at the same time — Danny Bonaduce and Barry Williams. A Brady and a Partridge together on one call talking about their campy Syfy flick Bigfoot. We ask, does it get any better than that? We’ll let you be the judge. Danny and Barry were approached by Syfy to star in the made for TV movie about two enemies banding together to chase the elusive Sasquatch creature (who happens to be the size of King King for this film, of course). And the only team that made sense to cast for the parts was Danny and Barry — childhood TV rivals for our love and affection every Friday night. Danny praised Barry numerous times during the interview for being the consummate actor and a complete professional who took the craft of acting very seriously. And Barry credited Danny with being the comic relief on a sometimes brutally challenging set — pretty much the characteristics we had hoped for when we learned about the call. But wait, back up. Did Barry just say, “I’ve got a great show that’s about The Brady Bunch”? You heard right. When he’s not on the road doing movies or plays, Barry has hunkered down in Branson, Missouri, and is producing a multi-media show called Lunch with the Brady Bunch. Road trip, anyone? Check your local listing for airings on Bigfoot on Syfy channel. And to get tickets to see Lunch with the Brady Bunch click here. And to listen Danny’s radio show live visit the KZOK website.